Outlook has a neat feature called Contact Linking that allows you to link a contact with any appointment, task, other contacts, or even email. Prior to Outlook 2007, the forms had a field with a Contacts button. In Outlook 2007 and Outlook 2010 you needed to go into Contact Options and enable a setting to see the Contact Linking field. In Outlook 2013 and 2016, this option is gone. You can still link Contacts in File, Properties (or Options dialog) of an open item but that is an extra step. Fortunately, there is a way to enable the Contact Linking field: edit the registry. Type Windows key + R to open the Run command then type regedit and press Enter. Browse to the preferences key, right click on it and choose New > DWORD. Type or paste showcontactfieldobsolete and set the value to 1 to show the Contact linking field. Set it to 0 or delete the DWORD or to turn it off. If you don't want to edit the registry yourself, I have a ready-to-use reg file available for download. To use the reg key, download the file then double click to run it. Answer the prompts to add it to the registry. Restart Outlook for the change to take effect. Same procedure for Outlook 365. I was able to add the "Link Contacts" with the downloaded file, however, in our SHARED contacts, I still cannot see it even though it has been added to the "host" computer and mine. In other words, from my computer I use 'Shared Contacts John Doe'...I see the link from John Doe's computer, but not on mine. Is there a fix for this? No, sorry, you can't see the links if the contacts are in a shared mailbox. Thank you, thank you, thank you. I really missed this option! I can´t understand why Microsoft would eliminate something that is clearly so helpful. Thank you so much! I have been hanging on to my Outlook 2007 just for this feature. I know the activities tab is gone in contacts and you mentioned a macro to view all previous correspondence but I need to be able to see all prior calendar items for that contact. Is there a way to do this as well? I'm completely distraught over updating my beloved Outlook 2007 and potentially losing 15 years of client notes/calendar items. I plan to reluctantly switch over to Outlook 2016 when MS stops supporting 2007 in October. If there is no way to see all previous calendar items for a contact I may have to explore other options. You won't lose the items, just won't be able to find them as easily. Outlook 2016 has (for now) the People Pane, which will show the last 50 - 250 messages, attachments, and meetings with the person. It was part of the social connector, which was deprecated so who knows how long we'll have it. I've downloaded Outlook 2016 on my laptop to play around with it and I hate the People Pane. 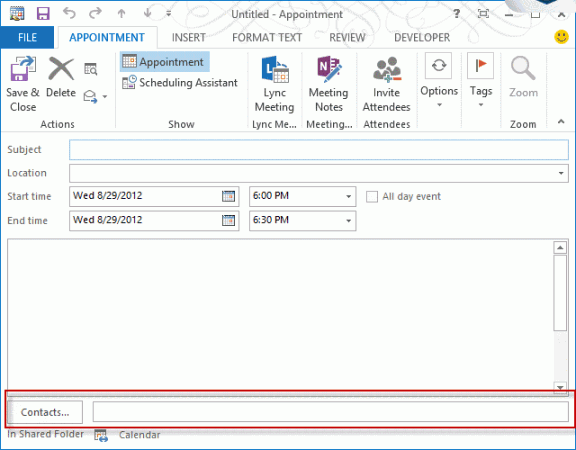 I may have had a few hundred emails with a client but only 2 or 3 meetings where I took detailed notes in the outlook calendar appointment.The People Pane is a cluttered mess that replaces an elegant solution for me. I need a way to pull up only the activities for a contact and inversely a contact field in the appointment. I'm trying to have a go at Pimero but am struggling to import my 15 years of appointments into this somewhat clunkier program. Once again, thanks for the help but shame on Microsoft for getting rid of this truly useful feature. I have tried the above patches, and have tried to put in the DWORD manually, but unable to get linked or related contacts to show on my laptop running W10 w 365 pro. I've tried the patches, no joy, then did DWORD in 32 and in 64 bit, with 1 in hexagonal. Help. Thank you. Did you restart Outlook? Try running the reg file for group policies then restart outlook. Diane, Do the patches work with Office 365 Professional, E5 on a Lenovo Yoga running 10 Home. I just returned the Yoga, and will retry with a new Carbon X1 5th running 10 Pro in a month. All outlook reg keys work with all computers - the version of outlook is what is important. E5 (and E3) fully support the registry edits. The Home and Business subscriptions don't support every key under /policies/ but may work with the same value under the normal path (remove /policies from path). Make sure you use the right key for your version and restart outlook. I recommend using the reg files, to be sure you don't mistype (it happens surprisingly often). I'm assuming you used the Outlook 2016 key, unless you have 2013... it definitely works with 2016 (i have the key set in the user path) - and with proplus, either the user or the policy key should work. (Some policies keys wouldn't work with the home version.) Did you restart outlook? Diane, thank you for this post. I just got my new thinkpad with W10-64 Pro, and was able to use your regedit changes to show related contacts in Outlook 2016.
oh, do you have the consumer version of Office 365? Some reg keys and policies won't work with that version - these *should* but i will test them to verify. Hello. I done the registry change and it worked great. Thank you! I now have the "Contacts" show up when I make a new appointment. I was wondering if what I am trying to do is even possible but what if I went into my contacts list and selected the person who I had previously put in an appointment for (I selected their name in "Contacts" when I created the appointment). Am I able to see any associated calendar appointments for this person? I don't see anything in the contact card that would display this type of information. It's just so if I am scrolling through my contacts I can go in and check if there are any appointments associated with them. Hope this makes sense as I am not sure if I'm explaining it correctly. Are you importing when you upgrade? If you keep the same mailbox or pst file and open it in the new version, you shouldn't lose linking. You will lose them if you use import.